This hilariously honest mug is sure to help you through your week, however mundane it may be! 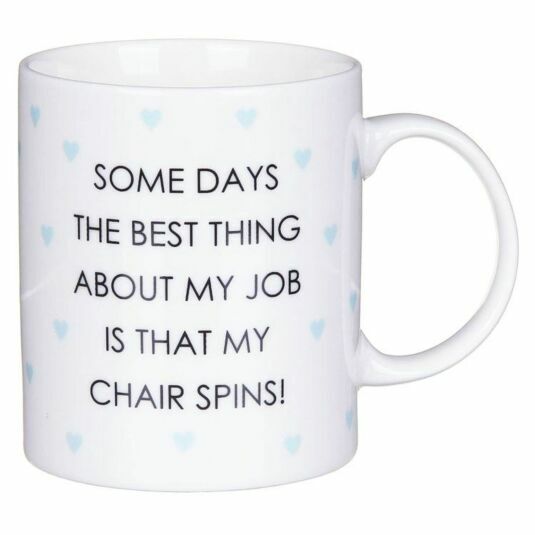 SOME DAYS THE BEST THING ABOUT MY JOB IS THAT MY CHAIR SPINS! 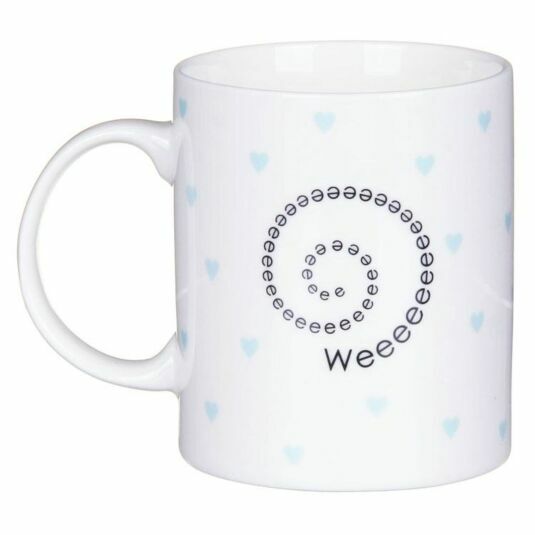 On the other side of the mug are the words Weeeeeeeeeeeeeeeeeeeeeeeeeeeeeeeeeeeeeeeeeee written in a spiral, and surrounded by light blue hearts. 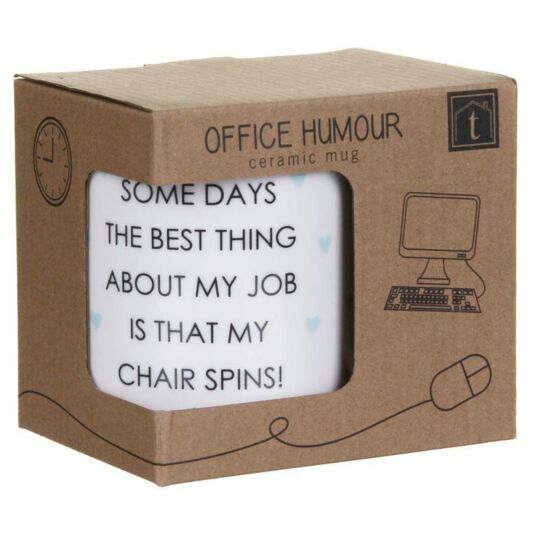 The ceramic mug comes in a presentation box, making it the perfect gift for anyone who needs a little humour in their lives! The idea was born in India, 1979, when a travelling, somewhat unwashed (his words, not ours) Shane O’Mahony hit upon an idea. He began importing local gifts to the UK, and thus Transomnia’s affinity with hand-crafted giftware began. For the last thirty years (and more) Shane has been travelling regularly to small villages and towns throughout Asia, seeking out hidden treasures to bring back to England. Any excuse to go travelling! Throughout that time, Shane and his colleagues have stuck to the principles they started with. They believe in building long-term, mutually beneficial relationships with the craftsmen and craftswomen with whom they work. In fact, they are currently buying products from a young man in Kashmir who is the son of Shane's very first supplier in 1979. As a result, Transomnia's products are different – and special. Almost all of them are hand-made or hand-finished, and they combine the inspiration of the company's talented young designers with the traditional craft skills of artisans from all over Asia. The company have now moved to a bigger premises near Tunbridge Wells, Kent, and although the building may be thousands of miles away from India 1979, the same spirit lives on. We think you'll like them!